From the folks at Concert Hotels, “100 Years of Rock in Less Than a Minute.” Rock’s family tree– from 1900 to 2000– unspools (as excerpted above); and each box, when clicked, plays an example of the genre. Educational fun for all! 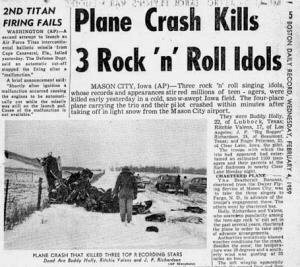 As we turn it up to 11, we might recall that this date in 1959 was “the day the music died”: the day that a plane crash near Clear Lake, Iowa killed Buddy Holly, Ritchie Valens, J.P. Richardson (aka, The Big Bopper), and pilot Roger Peterson. If Beethoven had been killed in a plane crash at the age of 22, it would have changed the history of music… and of aviation.